“Educators are fed up…Colorado has, year over year over year, significantly underfunded our public schools. Colorado’s teachers’ union expects more than 400 teachers at a rally that’s planned for Monday at the state’s Capitol in Denver. Englewood School District, outside the capital city, announced on Sunday that schools would be closed the following day as 70 percent of its teachers had indicated they wouldn’t be working Monday. It was unclear on Sunday whether more school districts would be closing. “We are calling Monday, April 16th a day of action,” Kerrie Dallman, president of the Colorado Education Association (CEA), told KDVR in Denver. 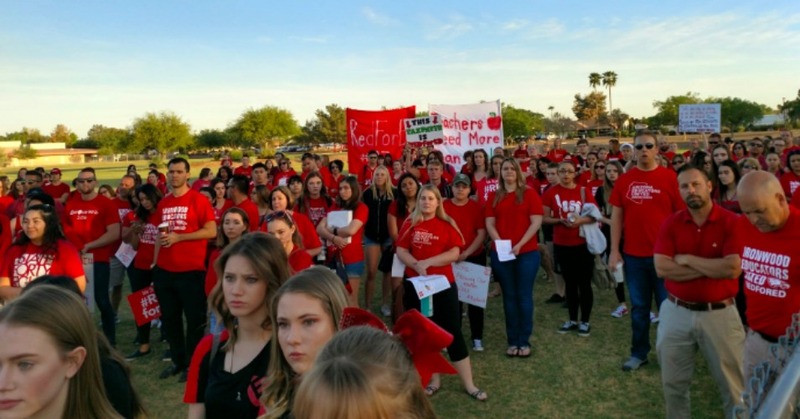 The striking teachers are planning to wear red, as teachers in a number of other states have in recent weeks while rallying at their state capitols for higher pay, greater education funding, and an end to the corporate tax cuts that have caused school spending to fall by the wayside over the past decade. According to KMGH in Denver, “The CEA estimates that teachers spend on average $656 of their own money for school supplies for students.” The state’s teacher salaries rank 46th out of 50, with educators making an average of $46,000 per year. Public schools are underfunded by $828 million this year, Dallman told the Post, and lawmakers have said they could inject at least $100 million more into schools—but they have yet to do so. “The positive state revenue forecast clearly demonstrates there is substantially more money available this year and therefore we can and must do a better job funding our public schools,” Dallman said. The planned protest follows a trend that was seen in West Virginia and Kentucky before moving west this month to Oklahoma and Arizona as well as Colorado. In all the states where teachers have walked out and rallied at their Capitols, teachers have reported paying for school supplies out of pocket, working second and third jobs to make ends meet, and coping with funding shortages while their legislators hand out tax cuts to corporations. This entry was posted in Austerity, Civil Rights, Corruption, Demonstrations & Protests, Economics, Education, Government, Peaceful resistance, Social Justice, Solidarity, Unions and Organized Labor, Women's Issues, Workers' Issues and tagged Arizona, Civil Rights, Colorado, Corruption, Economics, Education, Kentucky, Oklahoma, Protests, social justice, Solidarity, Teacher's Strike, teachers, Unions, West Virginia, Women's Issues, Worker's Rights, workers' issues on April 16, 2018 by ew.